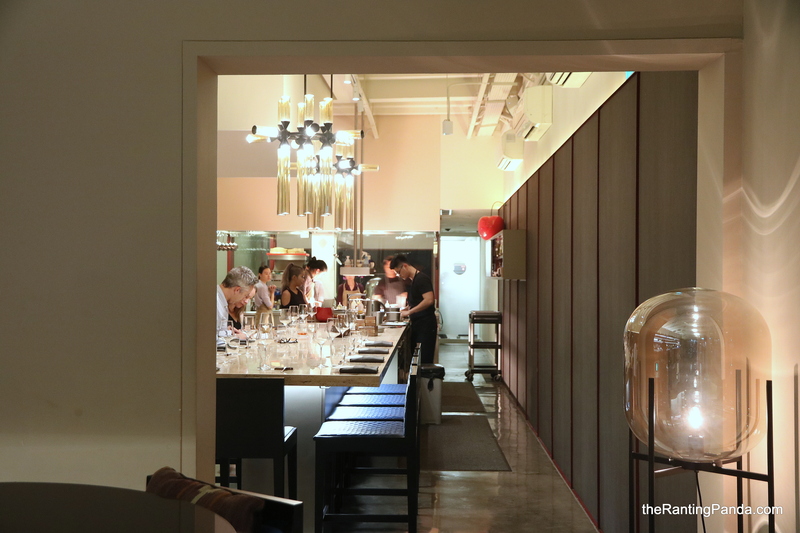 The Place If you have been following the Michelin dining scene in Singapore, restaurant Nouri located at the buzzing Amoy Street is one name which you must have taken notice. I’m glad I finally checked it out recently with some foodie friends, where the contemporary looking restaurant is located right opposite Kimme. A joint venture between Unlisted Collection and Executive Chef Ivan Brehm, previously Executive Chef of One Michelin starred Bacchanalia, the restaurant space spots a open kitchen concept with an intimate counter seating as well as tables for various party size. We were lucky to score a table at the semi-private dining space which holds our private conversations well, I hope. The Food It is hard to pinpoint a particular cuisine for Nouri as my impression after my dinner meal is that the dishes take influence from various parts of the world. I shall define it as world cuisine. For dinner, the 5-course Chef Tasting Menu is S$145++, 7 course at S$175++, or you can go for lunch from S$85++ for its 5 course Omakase Lunch Menu. I went for the 5-course Chef Tasting Menu for dinner and the portions are just right for me at the end of the meal as there were multiple snacks served in between the courses. We started with the Bread and Broth, rye sourdough bread served with a silken cheese bowl topped with extra virgin olive oil and 25 years old balsamic sauce. The interesting bit here is also the vegetable broth served, a comforting and interesting pair with bread which is quite oriental in itself. Dip the bread in the tofu balsamic sauce and have the broth intermittently, it’s awesome! I could do with more of the vegetable broth, prepared from seven organic vegetables from various regional farms finished with some parsley oil. My tip is also to ask for some butter, which I thought should have been served together as well without us requesting. The butter is an interesting flavour of basil leaf, which goes very well with the sourdough bread baked in-house for two days. Next up is a snack of Watermelon radish kimchi served with bonito, which is quite a Korean inspired dish with subtle hints of kimchi. The second course is the Kanzuri and Carabinero. Kanzuri is a type of Japanese chilli paste which originated from Niigata prefecture, and here in the dish is also the aged carnaroli rice as risotto served along with deep water scarlet prawns. The sauce itself is very good, and there is also that circle bit of dark red emulsion from the essence of the prawn head. This dish is spot on. The third course is the Acaraje and Vatapa, a type of Afro-Brazilian fritter served with turmeric and coconut sauce, cashew and salted prawn vatapa. The sauce reminds me strongly of Thai curry, while the African inspired fritter does have some familiar Asian flavour as well. The fritter is also apparently quite a popular Brazilian street snack! The curry sauce is amazing. Right before our mains was served, Chef Ivan dropped by to apologise that he wasn’t satisfied with our wagyu rump cap and he was going to re-cook it. I thought that this is such a nice touch because he bothers to update his customer and manage their expectations. This is a Michelin standard of service already. To fill up our waiting time, we were served another snack and I am glad I had this – Octopus served with watermelon radish along with black pepper and vanilla sauce. I am in love with the sauce, which is a very local sauce commonly seen in black pepper crabs. On to our fourth course, the mains is a choice between the Saffron Fish or the Beef and Oils. I chose the beef, a grass-fed wagyu rump cap with fermented jalapeño pepper paste, aromatic oils and panzanella. There is also bits of pistachio with the pepper paste sauce, which I enjoyed more than the flavour of the beef itself. The next course is our Pre-dessert, a small serving of nasturtium marshmallow with candied orange. For our last course, the dessert is the Peanut Soup. I was sceptical of it initially as I can’t help but picture it as the Cantonese style peanut paste but I was so wrong. This peanut soup is probably one of the best versions I have tasted. It is served with aged mandarin sorbet, confit mandarin segments and halwa. The peanut paste taste is just right and not too in the face, while the mandarin flavour just complements the peanut flavour so perfectly, a surprise to me. One of the best desserts I had this year so far. And just when I thought the meal has ended, we were served the post dessert snack, a single origin chocolate from a farm in Pahang, Malaysia and is only served right here at Nouri. Pardon my scepticism once again as I didn’t expect Malaysia to produce such good cocoa. This chocolate is served warm, so the richness of the dark chocolate literally melts in the mouth. Another fun bit here is a puzzle box which we have to unbox the puzzle to retrieve the candied nutmeg within. It’s more of adding an element of interaction to the dinner experience than anything. We were also served Sri Lanka Ceylon tea to conclude the meal. Rants Are Michelin restaurants necessarily expensive? This is a topic for another day but be prepared to splurge at Nouri if you are planing to head for dinner. Will I Return Again? My dining experience at Nouri is a pleasant one with most of the dishes with a fine execution of most of the dishes. The service is competent and not too stiff and awkward like some fine dining establishments. It is well-deserving of its Michelin accolade. Make your reservation instantly at Nouri here.